Manchester United were 3-1 winners against Arsenal at the Emirates Stadium this evening to book our place into the fifth round of this season’s FA Cup. Goals from Alexis Sanchez and Jesse Lingard saw us race out to a 2-0 first half lead before Pierre-Emerick Aubameyang pulled one back for the hosts before half-time. In an open second half substitute Anthony Martial secured our passage into the next round in the final 10 minutes on the counter-attack. Caretaker manager Ole Gunnar Solskjaer has now won all eight games in charge of Manchester United. Sergio Romero 8 – A couple of good saves to deny Aaron Ramsey from close range and Alexandre Lacazette in the second half. The Argentine has saved nine of the 10 shots he’s faced in this season’s FA Cup. Ashley Young 5 – Arsenal’s goal came from down Ashley Young’s side for which Ashley Young was largely responsible. The captain also picked up a yellow card and didn’t always distribute the ball well. Eric Bailly 7 – Made a couple of important interceptions and clearances in and around our penalty area. Victor Lindelof 8 – Solid at the back this evening with numerous clearances whilst Pierre-Emerick Aubameyang scored with his only effort on target. Chances were few and far between for the Arsenal strikers. Comfortable bringing the ball forward on the night too. Luke Shaw 8 – Didn’t bomb forward as often as he does from left-back but Luke Shaw was very good defending this evening. Nemanja Matic 8 – Made numerous tackles all over the park as Nemanja Matic helped us win back possession, was good at maintaining it and prevented Arsenal from creating much through the middle. Ander Herrera 7 – Didn’t see as much possession as usual and was sloppy at times with the ball. Ander Herrera worked hard off the ball to win it back for us like a terrier throughout the 90 minutes. Paul Pogba 7 – Influential on the game and it was Paul Pogba’s effort that Petr Cech parried into Anthony Martial’s path for our third goal to kill the game off. Jesse Lingard 8 – Very composed finish to make it 2-0 in the first half. Substituted in the final 10 minutes after getting in a scuffle moments before having already been booked. A passionate performance from the youth product who created a couple of chances and was key during our first half counter-attacks. Romelu Lukaku 7 – Excellent down the right-hand side in the first half, Romelu Lukaku set up our opening two goals. Didn’t test Petr Cech himself though, before being replaced by Marcus Rashford for the final 20 minutes. Alexis Sanchez 8 – Excellent finish for the opening goal. 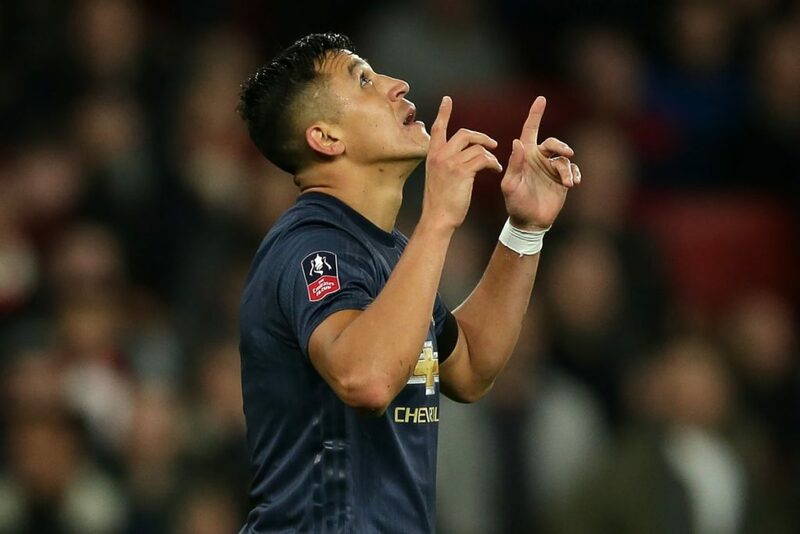 Alexis Sanchez caused problems against his former club before being replaced in the final 20 minutes. This was the Chilean’s first appearance in three weeks and Ole couldn’t have asked for much forward. Marcus Rashford (20 mins) N/A – Brought on as the game was heading into an end-to-end passage but didn’t actually seen a sight on goal. Anthony Martial (20 mins) 7 – Right place at the right time to score the killer goal. Otherwise, Anthony Martial didn’t see much of the ball. Phil Jones (4 mins) N/A – Brought on to help us see out the game and to make sure we finished the game with 11 men as Jesse Lingard was risking a second yellow card.